Easy microwave meals are an excellent choice for parents who are looking for fun activities to do with their child. Teaching your children how to make simple, tasty microwave recipes will not only prevent them from having to use the stove to make an afternoon snack, but may also instill in them a sense of confidence knowing that they have the ability to do something for themselves. When you are considering which types of microwave recipes to teach your child to make, your must first consider what makes a perfect microwave meal. Ideally, easy microwave meals should be just that, easy. You want your child to be able to make these dishes with ease, so it is important that the recipes you choose have limited ingredients and preparation instructions to help limit the chance of them making mistakes. Having said that, numerous easy recipes can be used that require very little time or effort. 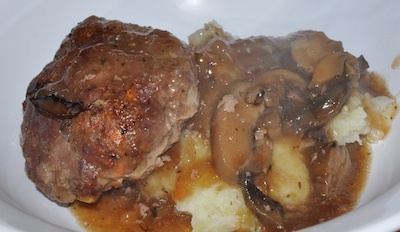 You will first need to place your beef inside your casserole pan, breaking it up with a fork as best you can and distributing evenly along the bottom. As with other easy microwave meals, put your casserole dish in the microwave for 6-8 minutes to cook the meat. Drain as much fat out of the casserole pan as possible. Stir the meat around again with a whisk or another large utensil to help crumble the meat even further. Add your remaining ingredients to the casserole pan, mixing them with the hamburger meat until distributed evenly throughout the mixture. Cover your dish and microwave the concoction for 15-17 minutes until the noodles are tender, remembering to stir occasionally throughout the process. Let cool to a tolerable level before serving. Place chicken breasts in a microwave dish. Top with sauce. Cook in the microwave for 4-5 minutes. Sprinkle with cheddar cheese and bacon bits. Cook in the microwave for another 3-4 minutes. Combine all ingredients in a bowl and combine together with your hands. Form into a loaf and place in a glass loaf pan. Cover with microwave safe waxed paper and cook in the microwave for 15-20 minutes or until meat thermometer reads 160 degrees. Blend together cornstarch and beef broth in a microwave safe casserole dish. Stir in mushrooms, Worcestershire sauce and basil. In a separate bowl, blend together and mix together egg, bread crumbs, onion, salt and pepper. Add ground beef to bread crumb mixture. Mix together until you can form into 6 patties and place in the microwave safe casserole dish. Microwave patties on high for 6-10 minutes or until patties are cooked through. Halfway through cooking turn patties around. Spread butter on French bread and add a slice of bologna and salami. Add sauerkraut and cheese. Place on a microwave safe plate and microwave for 3-4 minutes or until warmed. Combine milk, flour, water, chicken bouillon cubes and half and half in microwave safe dish. Whisk together. Add in broccoli and cook in microwave several minutes stirring often. Stir in cheese and cook until cheese is melted and broccoli is tender. In a microwave safe casserole dish, melt butter. Stir brown sugar and sage into butter until well combined. Add squash wedges. 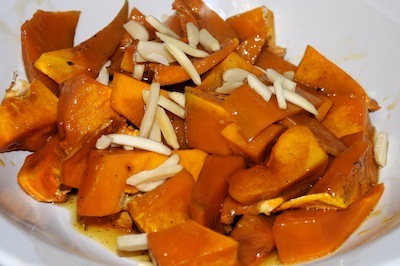 Bake for 5-10 minutes in the microwave until squash is tender. Sprinkle with nuts. In a microwave safe casserole dish, add water and green beans. Cook for 15-18 minutes or until tender. Drain water off green beans and season with salt and pepper. In a microwave safe casserole dish stir together soup and cream cheese. 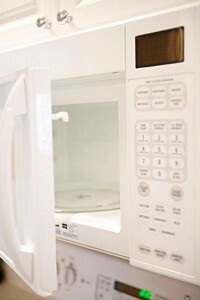 Microwave for 2 minutes or until cream cheese is melted into the soup. Fold in potatoes and combine until well covered. Bake for 10 minutes in the microwave or until potatoes are tender. Sprinkle with cheddar cheese and cook another 2 minutes until cheese is melted. ~If using fresh potatoes you'll need to cook for additional time. 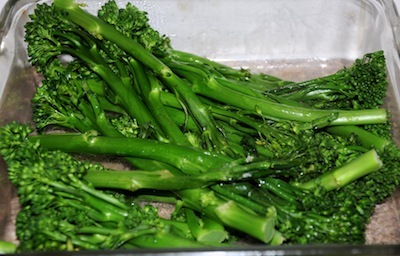 Cut broccoli in florets and place in a in a microwave safe casserole dish. Add 1/4 Cup water and cook in the microwave for 3-5 minutes. Drain water off broccoli and season with lemon, salt and pepper. ~If you like cheese on your broccoli, sprinkle broccoli with 1/2 Cup shredded cheddar cheese and microwave 1-2 minutes until cheese melts. Add apples to a microwave safe casserole dish, add apples. Place a candy, then a marshmallow in the center of each apple. Cover the dish with plastic wrap or waxed paper. Microwave for 7 minutes. Add another layer of candy and marshmallows. Cover and cook again for 5 minutes. Several small microwave bowls Prepared in several small bowls, this recipe makes a tasty snack for typically up to four people depending on the size of your apple-filling can. Pour approximately half a cup of the pie filling into each dish. In a separate bowl, mix your Bisquick, cooking oats, cinnamon, butter and brown sugar stirring with a spoon or fork on until clustered and clumpy. Using a large spoon spread the contents of this mixture evenly between the bowls of apple filling. Allow this crunchy mixture to stay on top of the apples. Do not mix it in. When it is time to cook, cover the bowls with wax paper and heat each bowl individually in the microwave for 3-4 minutes. Let the dishes stand for 10 minutes to set and cool before serving. 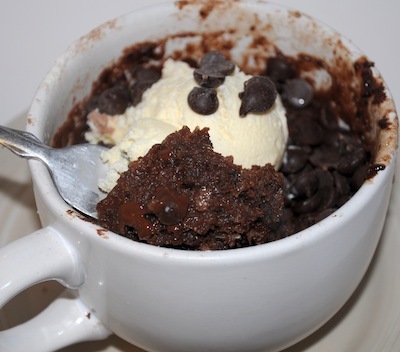 See how to make chocolate cake in a microwave. Here are some tips for teaching your kids to use the microwave. Using easy microwave meals to create easy, delicious meals and snacks for your children is sure to not only save you time but also give you an outlet to interact and teach your children about cooking.